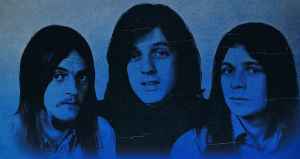 Blue was a British pop/rock group formed in Glasgow, Scotland, in 1973 by Timmy Donald (b. 1946, Bristol, Avon, England) (drums), Ian MacMillan (b. 1947, Paisley, Strathclyde, Scotland) (bass, guitar, vocal), and Hugh Nicholson (b. 1949, Rutherglen, Strathclyde, Scotland) (guitar, vocal, keyboard). Signed to Elton John's Rocket Records label (John also produced them), they released their self-titled debut album, then added Robert "Smiggy" Smith (b. 1946, Kiel, Germany) (guitar) for their second, Life in the Navy. They were then reorganized, with MacMillan and Nicholson remaining and adding Charlie Smith (drums) and David Nicholson (guitar). This lineup scored a U.S. singles chart entry and U.K. Top 40 hit with "Gonna Capture Your Heart" and recorded the third album Another Night Time Flight (1977) and the fourth album Fool's Party (1979), after which Blue broke up.